No changes to the banlist. The last banlist announcement shook up the format significantly, ridding it of two quite dominant commanders. The result has been a renewal of diversity, with less players afraid of losing very early in the game. Many different decks now appear in top8s and new, unexpected strategies pop up regularly. Only Geist of Saint Traft has kept posting consistently good results; however it’s not present in every top 8 and remains quite beatable. Overall, it feels like the metagame is still trying to stabilize. We are thus making no changes to the banlist this time. A multiplayer draft expansion called Conspiracy is set to come out on June 6th, 2014. While this set is geared at multiplayer draft play, it will contain 65 new cards usable in Eternal formats, among which Duel Commander. 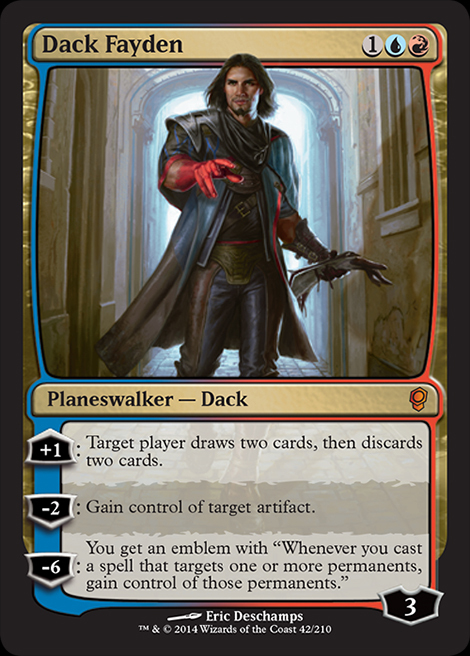 Excited about the idea of playing with Dack Fayden? We are too! As such, because there is always the potential for format-imbalancing cards to be printed, we’ll make a small announcement on June 9th, 2014 – just in case we think anything is too good for Duel Commander. We don’t expect any banning, but one never knows. As usual we welcome your feedback. While we read most of the forums out there, the best way to make yourself heard is by writing us HERE. The next announcement is expected to be on June 9th, 2014.